The musical play "Cambodian Rock Band," starring Brooke Ishibashi, opens next week at South Coast Repertory. The cast of “Cambodian Rock Band” includes, from left, Brooke Ishibashi, Raymond Lee, Joe Ngo, Jane Lui and Abraham Kim. 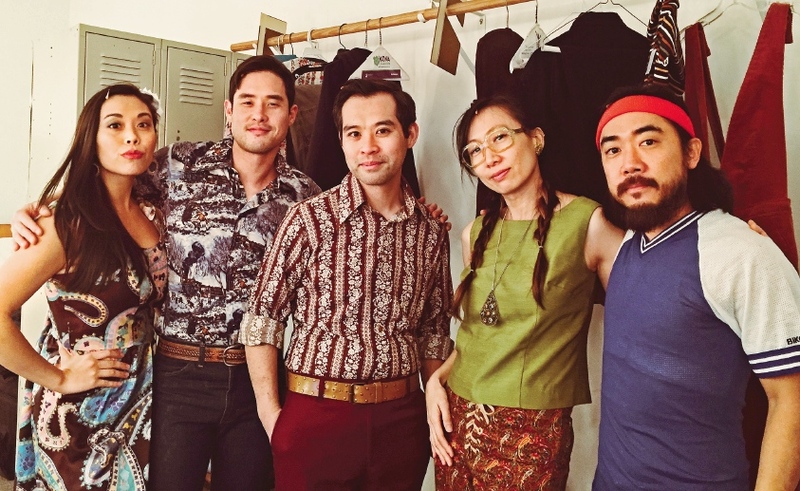 COSTA MESA — “Cambodian Rock Band” by Lauren Yee, directed by Chay Yew with music by Dengue Fever, will be performed at South Coast Repertory, 655 Town Center Dr. in Costa Mesa. 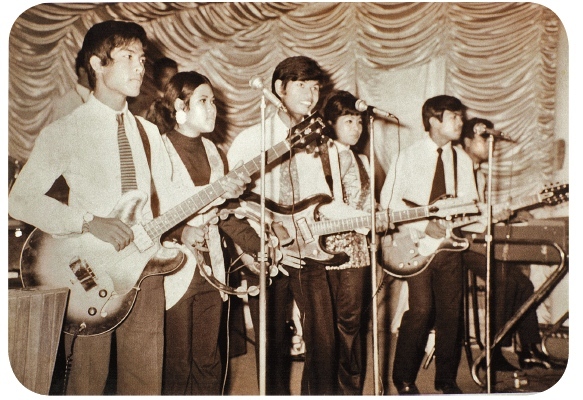 “Cambodian Rock Band” is set in Phnom Penh and moves back and forth in time. It’s the story of a young Cambodian American who has found evidence that could finally put away one of the Khmer Rouge’s chief henchman, a man who oversaw the country’s most notorious prison. But her work is far from done. Her dad shows up unannounced — his first time back in Cambodia since fleeing 30 years ago — and it’s clear that this isn’t just a pleasure trip for him. The cast includes Brooke Ishibashi, Abraham Kim, Raymond Lee, Jane Lui, Joe Ngo and Daisuke Tsuji. The Cambodian surf-punk scene in the mid-1970s was crushed under the authoritarian rule of the Khmer Rouge. Pictured: Bayon Band. She was a Dramatists Guild Fellow, a MacDowell Fellow, a MAP Fund grantee, a member of The Public Theater’s Emerging Writers Group, a Time Warner Fellow at the Women’s Project Playwrights Lab, the Shank Playwright-in-Residence at Second Stage Theatre, a Playwrights’ Center Core Writer, and holder of the Page One Residency at Playwrights Realm. “In a Word” won the Francesca Primus Prize and was a finalist for the American Theatre Critics Association/Harold and Mimi Steinberg Award. “The Hatmaker’s Wife” was an Outer Critics Circle nominee for the John Gassner Award for best play by a new American playwright. She earned a BA from Yale University and an MFA from UC San Diego. Yee wrote “Cambodian Rock Band” on commission through SCR’s CrossRoads program, which develops plays that explore the cultural diversity of Orange County through artist residencies. For “Cambodian Rock Band,” Yee’s residency cast a wider net, including Long Beach. CrossRoads is supported by a grant from the Time Warner Foundation. The design and creative team includes Takeshi Kata and Se Oh, scenic design; Sara Ryung Clement, costume design; David Weiner, lighting design; Mikhail Fiksel, sound design; Matthew MacNelly, music director; and Joanne DeNaut, CSA, casting. The production manager is Joshua Marchesi and the stage manager is Bryan Sommer. Andy Knight is the dramaturg. “Cambodian Rock Band” has generous support from honorary producers Carolyn and Bill Klein and Samuel and Tammy Tang. The media partners are KCRW, Orange Coast Magazine and the Orange County Business Journal. This play is a recipient of an Edgerton Foundation New American Plays Award. Previews are from Sunday, March 4, to Thursday, March 8; opening night is on Friday, March 9; regular performances are from March 10 to 25. Showtimes: Tuesday through Friday at 7:45 p.m.; Saturday and Sunday at 2 and 7:45 p.m. (matinee only on closing day). Running time: About 2 hours and 15 minutes, including intermission. Recommended for ages 13 and above. Contains adult language, haze effects, smoking of electronic cigarettes, loud music and violence. Tickets start at $23. Discounts are available for full-time students, patrons 25 years of age and under, full-time educators, seniors and groups of 10 or more. For complete information, call (714) 708-5500 or visit www.scr.org.